How much time did you spend on hotel searching when you planned for your last vacation or trip? Don’t feel embarrassed to say hours, because you are absolutely not alone. There are so many factors to consider: price, location, service quality, facilities, space, cleanliness, room comfort, convenience, noise, view, breakfast, bar and restaurant, transportation and parking options, reward programs and neighborhood safety. Prevailing travel search sites provide you overwhelming hotel information, hoping one of the choices fits your requirement. But every traveler has to waste lots of his/her valuable time in filtering out irrelevant search results. In our opinion, personalized hotel search is the only way that can help you make decisions wisely and quickly. With a traditional travel site, you search for a destination and it returns dozens of results. You have no idea how those results are ranked. You need to review them one by one, dig into individual pages to find out information you care about, and compare multiple candidates side by side. Furthermore, you’d better to check other travel sites to make sure you get the best prices. The whole process can easily take a couple of hours. And the most frustrating part is that you need to repeat the same process when you have another trip. Sometimes you have to reserve a hotel with your smart phone. Can you imagine how hard it is doing all of the above mentioned researches and comparisons with a tiny screen? Different from traditional travel search sites, FindOptimal does all time-consuming work for you. As a personalized search engine, FindOptimal remembers and uses all your preferences in property type, star rating, brand, price range, amenity, customer rating, etc. It collects hotel information, filters properties and compares prices based on your preferences. You just need to define those preferences once. Then, you can relax and let FindOptimal identify the best hotel for you in all future trips. What a big time saver! 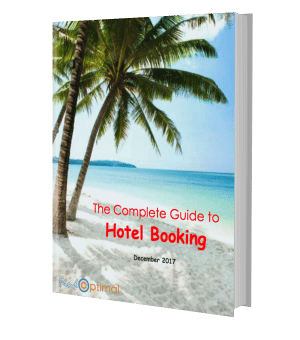 With FindOptimal, you can also enjoy booking a hotel with a smart phone because most hard work has already been done in advance. We know you have different preferences in hotels when you take a family vacation versus taking a business trip. FindOptimal allows you to save a set of preferences as a profile. 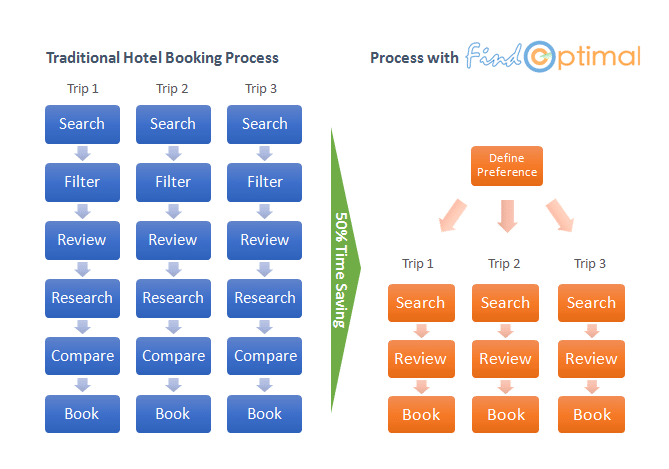 In this way, as long as you log in and pick up the right profile, FindOptimal will retrieve your preferences and use them for your hotel search.